Like their kindred words in the other Celtic tongues, the syllables* of this Cornish saying still echo, telling of the “Once and Future King.” They assert a living archetype of a king born in fulfillment of prophecy, a ruler recognized and granted kingship by the Lady of the Lake, a leader who struggles, fights and dies for his people. The king is the land. Nyns yu marow Arthur myghtern. “He is not dead, king Arthur,” the story continues, but sleeps, and will wake at his country’s direst need, and return. The king is the land. Arthurian tarot decks like John and Caitlin Matthews’ Hallowquest, Anna-Marie Ferguson’s Legend and Stephanie and Philip Carr-Gomm’s Druidcraft packs often depict the archetypal king as card 4, the Emperor. This is Arthur as anointed ruler, secure in his kingship, enthroned, crowned and robed in power. But surely what moves us more is not merely this static image, forceful though it can be. 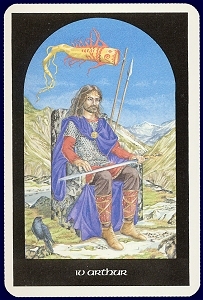 The young Arthur, ignorant of his destiny, is also the seeker, the Fool, the first card in the deck, a numerical 0. In Ferguson’s Legend deck he is Percivale, the callow and naive youth. With both Guinevere (Welsh Gwenhwyfar, “White Shadow”) and his own sister Morgan (with several other variants of her name) he is one half of the Lovers. And at least in the Matthews’ conception, he is the Wounded King, and also the Sleeping Lord. 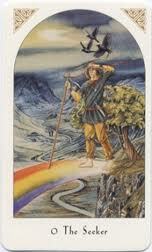 The progression, as in most tarot decks, is the journey of the self toward fulfillment, wisdom, self-awareness. 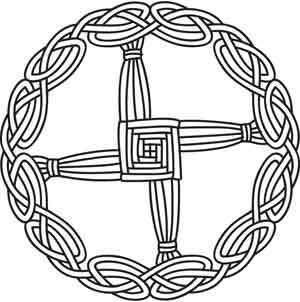 As a tool for Druidic meditation and ritual, the Arthurian mythos offers rich and profound material. Map our lives onto such a mythic pattern, and we can animate energies to manifest the next step on our spiritual journey. At every point we spiral. We can look at all the steps, all the places on the curves and whorls of the spiral, as potentials for us — right now. Not later. Not after we do or learn or master or win X. Now. The king who will be, but sleeps, is a potential which can guide the questing boy who will be — and who also already has been — king. What might the king say to his younger self? What gift might our older selves pass to us right now, insight or wisdom or counsel we need as we grapple with problems, as it can often feel, in the dark? So many traditions around our planet speak in their own ways of time and space as illusions. This need not mean they are not real, but rather that we need not accept our agreement with an illusion as the last and defining word about our lives. They don’t have to be the only reality. By playing a game with time, we can slip into past or future through memory and daydream, to the point of no longer “being here” but “someplace else” instead. And we’ve all experienced this. For we do this effortlessly, ever since childhood, a natural talent, a birthright, a skill we keep all our lives, unless it’s been largely chased away and beaten out of us by our culture, teachers, parents, our own self-limitation, habits of thought, and so on. “Head in the clouds, dreamer, impractical, unfocused”: words so many of us may have seen in school reports, job assessments, personal evaluations. Or maybe we suffer from the opposite pole, and more and more of the lightness and joy has been leached from our days through routine, day to day cares, deadlines and installments and bills and mortgages and the nightmarish hope of someday “catching up” or “getting ahead” or “arriving.” Always, it can seem, one pole or the other. But polarized things gather power. That’s why an illusion can grab and hold us. But that’s also why change and growth and exploration are also — always — possibilities. Poles hold the energy for entrapment, but also for transformation. These images and this millennium-old mythos provide a wealth of meditation seeds, portals to discovery, and material for ritual that Arthurian orders of ritual and magic explore, but which are also perfect for solitary work, too. And if I’m willing to step across one more boundary, ritually priming myself with a “For behold: now am I ____ !” I can explore all the characters in the Arthurian realm. Taliesin-like, I can be the Green Knight, invulnerable to mortal blows, and Morgan and Merlin, Nimue and Mordred, too. What does it feel like to die as you kill your uncle-father (Shakespeare’s Hamlet knows!) in fulfillment of a prophecy from a time before your birth? What does it mean to lie asleep, waiting to fulfill a royal destiny? What part of me sleeps right now, that I can rouse if I choose? Or like Ygraine, Arthur’s mother, to carry an unborn child in my belly, a king, gestating and brooding and nourishing new and royal life from within? Or what can I see as Merlin in his cave or tower, looking up and down time itself, living backward as in T. H White’s version of the Arthurian boyhood story, The Sword in The Stone? Then to close the rite, the meditation: “And now have I returned.” A simple formula, but helpful, to ground the meditation, to signal a shift of reality. (Return is as important as departure.) Open your eyes, and record what you experienced. In this way, over days and weeks, you build an increasingly persuasive document that can help loosen the hold of the illusion of this time, this place. Each time I sit to meditate, the pages telling of my previous journeys in front of me, the grip of illusion eases. For these two things, time and space, can be potential gifts, or they can remain prison walls. They’re a choice, if I choose them, rather than a given, if I merely accept them. The Seeker from Matthews’ deck. Before us all lies the Rainbow Path. Starting small, with the trick, if you will, of imaginative magic, will begin to unfasten the iron clasps around consciousness. It’s just one way, of course. Traditions in and outside of a whole range of religions and spiritual paths offer many tools and strategies for accomplishing this change, if we wish it. But these particular images and this story have spoken for a thousand years to many people, and the Arthurian drama that can be a mirror and key to our mortal and spiritual lives shows little sign of a diminishment of its power to move and inspire — and transform. Sleeper, whispers a whole nation of people inside each of us that we have been and are being today and will be someday, a multitude of selves. Sleeper, awaken to your crown and to your destiny. Images: Matthews’ Arthur, card 4; Matthews Sleeping Lord; Matthews’ Seeker (Fool in other decks) with three choughs (a raven-like bird) overhead. 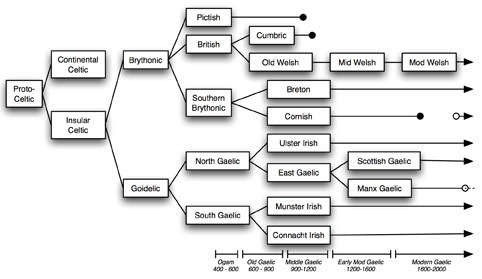 *Note on pronunciation: The -gh- of the Cornish word myghtern “king” is essentially the same sound as in German “Bach” and close to English “h” in “aha!”: mikh-tayrn comes reasonably close for ritual purposes: AHR-thoor MIKH-tayrn ah VEH hahg ah VEETH.